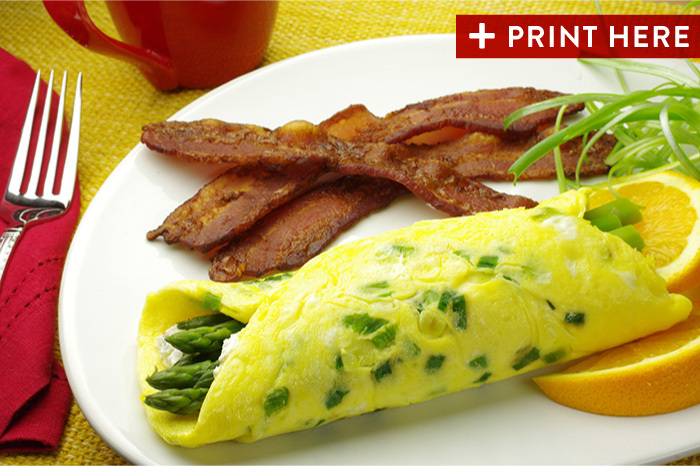 No matter the time of day, an omelet is often the perfect answer to the question, “What should I have to eat?” The ultimate in versatility, an omelet flourishes when filled with appetizing fillings and a little cheese to bond the flavors together in every forkful. 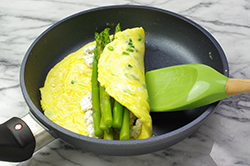 We’re celebrating spring with this simple omelet that features green onions and asparagus. We’ve chosen a fresh, herbed goat cheese for melting inside. It’s a simple formula that bears repeating often this season. Or, use the same technique and experiment with your own filling choices. (1) Prepare the asparagus by trimming and steaming until just tender. Set aside. Thinly slice the scallions, green and white parts. 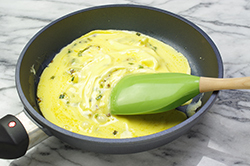 (2) Beat two eggs together with a tablespoon of heavy cream (or milk). (3) Heat a nonstick 8-inch pan over medium heat. Add the butter to the pan. 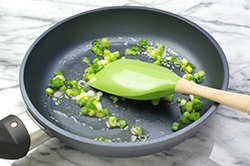 Once melted, add the scallions and cook for one minute or until wilted. Add the beaten egg mixture to the pan. 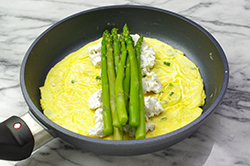 (5) Place pinches of the fresh goat cheese in the center of the omelet. 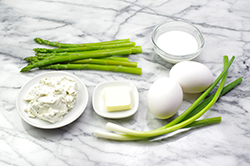 Lay the asparagus spears on top of the goat cheese. 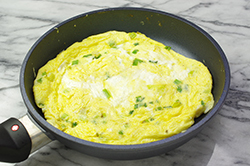 Flip one side of the omelet over the center in a “one-third fold.” Flip the other side over the center, and allow another 30 seconds of cooking to melt the cheese. 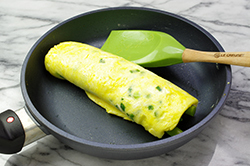 (6) Serve the omelet by rolling it out of the pan and onto a plate. Garnish as desired and serve immediately.